I don’t think I ever met Gene Herr, although our paths may have crossed many years ago, before I knew who he was and when I was even more of a nobody than I am now. Gene was a Mennonite, born and raised, who became a Roman Catholic in 2005 when he was in his seventies. Perhaps that sentence alone is enough to tell you why he is a hero of mine. 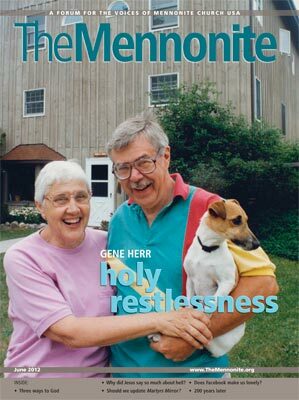 My wife assures me that I first learned of Gene Herr sometime in the late ’80s or ’90s, while he and his wife were living in Michigan where they had founded a ministry called The Hermitage. Located on 50+ wooded acres, The Hermitage was (and still is) a place for spiritual retreat and formation. When I included a description of the St. Patrick Center in the ministry prospectus which I wrote a year ago, The Hermitage was one of several similar endeavors which provided inspiration and a model for that vision. Gene Herr died on January 1 this year, although I did not learn of his passing until today. The June issue of The Mennonite, the monthly organ of Mennonite Church USA, published a major article which assessed the impact of his life and ministry. Gene Herr actually was what I have aspired to be—a sacramental and liturgical Anabaptist. The only personal contact I ever had with Gene Herr came about nearly two years ago, in August 2010. I had written a letter to the editor of the Mennonite Weekly (now World) Review. Gene read my letter and sent me a handwritten note of encouragement in response. I joined the Mennonite Church in 1982 and for 26 years served in a variety of ministry roles, including 8 years as a pastor and 14 years as a teacher in a Mennonite Bible college not affiliated with MCUSA. While teaching there, I came to appreciate the beauty and richness of liturgical worship. Since I was unable to find a Mennonite congregation in that area which shared my convictions, I began attending an Anglican church, but I never abandoned or compromised my nonresistance convictions nor my commitment to kingdom living and radical discipleship. Still, because I no longer attended a Mennonite church, my teaching contract was terminated in 2008. I am now preparing for Holy Orders in the Anglican Church in North America, not so much because I have uncritically embraced Anglicanism but because there seems to be more room for my Anabaptist convictions in the Anglican communion than for my liturgical sensibilities in Anabaptism. I am less an Anglican than a liturgical Anabaptist. In ’05, the 50th year of my ordination (as a Mennonite minister) at Scottdale, PA, I became a Roman Catholic. … I identify with your struggle and quest for a home. … Blessings to you as you live and serve between the traditions. I have many (Mennonite) friends and still am able to do some teaching in Mennonite settings. In response to God’s call,… Gene, a lifelong Mennonite, was received into the Catholic Church (in 2005). This step wasn’t a rejection of his Mennonite roots but the fulfillment of a lifelong faith as an Anabaptist, says Ivan Kauffman, who with Gene and others helped develop Bridgefolk, a movement of sacramentally minded Mennonites and peace-minded Roman Catholics who come together to celebrate each other’s traditions, explore each other’s practices and honor each other’s contribution to the mission of Christ’s church. “Gene did not turn his back on his Mennonite heritage or on the Mennonite church,” Kauffman says. “He continued to serve the Mennonite community in various ways to the end of his life. What he did do was find ways to make the riches of the pre-Reformation spiritual tradition, out of which the 16th-century Anabaptist movement emerged, available to 20th-century Mennonites. That is very similar to the testimony I could give regarding my own pilgrimage from Anabaptism to the liturgical tradition of Anglicanism. I did not grow up in Anabaptism, as Gene Herr did. And for nine years I was the face and voice of a group called Evangelical Anabaptist Fellowship, which pointed out areas within contemporary Anabaptism (especially MCUSA) where we saw evidence of “doctrinal erosion” and a slipping away from the orthodox heritage of historical Anabaptism. For both of those reasons, my transition from Anabaptism to Anglicanism resulted in greater alienation between me and my former associates within MCUSA than was true of Gene Herr in his relationship with Mennonites after his conversion to Catholicism. I have no idea what, if anything, will develop, in my case, as far as a significant ministry among Anglicans is concerned. So far, the landscape looks fairly bleak in that regard. But it may very well be that, through this blog and in other ways, I can still share with my friends and acquaintances in Anabaptism the reality which I have experienced through my encounter with liturgical Anglicanism. I am not out to make Anglican converts of Anabaptists. In all of my life and ministry, my goal is to encourage believers to take seriously the call of Christ to be faithful citizens of His Kingdom. The rich heritage of the liturgical tradition has been a great help to me in my personal pursuit of that goal. Gene Herr was an encouragement sent to me from God, and one of these days I will be able to tell him that in person. This entry was posted in Anabaptism, Anglicanism, liturgical tradition, spiritual formation, spiritual pilgrimage and tagged Anabaptism, Anglican Communion, liturgical tradition, liturgical worship, Mennonite Church USA, sacramentalism, spiritual formation, spiritual pilgrimage by Eric Kouns. Bookmark the permalink.